At most churches there are people coming and going all the time. This makes sense when you consider that churches tend to have events and programs for nearly every age group. All of these events and programs lead to a problem for most church communities though…the calendar. It begins to take on a life of its own and can become unruly if not managed well. Consider that in a given week a church may have events and programs for Children, Middle Schoolers, High Schoolers, College Students, Young Professionals, Men, Women, Small Groups, Outreach groups, Musicians, and Artists in addition to their regular weekend worship service(s). This is a lot to fit on a standard calendar, especially if clarity is something you enjoy. Most churches don’t have a good solution to this problem. Some churches rely on email lists to send out event reminders and announcements. But this isn’t sustainable over the long haul, especially if you have multiple email lists for different ministries. You have to constantly stay on top of the lists, ensuring they are up to date and accurate, which is not a great use of time. Other churches rely on a Facebook page to communicate their calendar of events and programs. This may work for some people but believe it or not, there are people who are not on Facebook. Why require the people in your community to sign up for a social platform they don’t want? Why not provide a better solution to the problem of event communication? Still other churches use expensive database systems to manage their communication needs. Most of these programs are powerful and handle events well. The catch is they also handle 100 other things: online giving, attendance, messaging, child check-in, etc. As someone who had to train an entire congregation on how to use one of these systems, let me tell you, it wasn’t fun…at all. Did I mention they are crazy expensive? None of these solutions is a home run. They work for certain situations but they all have fatal flaws be it upkeep, access, or cost. We believe that the best way to communicate the upcoming events and programs at your church is Events Calendar PRO. Events Calendar PRO For The Win! What Events Calendar PRO offers is a simple yet powerful calendar that can house all of your church’s events in one easy to access place…your own website! There is also no need for your community to sign up to use Events Calendar PRO, it just sits on your website waiting to share information with them. And there are no outrageous fees with Events Calendar PRO either. It’s just $65 for a ‘Personal’ license! Events Calendar PRO is simple. Add your event information, add a picture (if you want), publish and it’s added to the calendar. It doesn’t get much easier than that. Once the event has been added to the calendar your community will be able to see it on the calendar, click on the event for details, and import it to their iCal or Google Calendar if they’d like to. With the built in ability to view the calendar in multiple ways plus the ability to filter through event listings, the Events Calendar PRO provides a simple yet powerful calendar for your community to enjoy. You can even add ticket sales to the Events Calendar PRO. We have RSVP and ticket add-ons that allow your community to purchase tickets to upcoming events right from your calendar. This adds great value because it removes third parties and needless navigation. Simply find the event you want and purchase a ticket right then and there. This functionality can be incredibly useful for church plays, musicals, concerts, recitals, etc. Remove the ticket lines, the need to cash checks, and the possibility of misplacing cash while at the same time providing accessibility and ease for your community. It really is a win-win scenario. There are a few things you’ll need to do in order to get Events Calendar PRO up and running on your website. But don’t worry, the folks who keep your website in shape will be able to handle this quite easily. Your website has to be built on WordPress. If your church is not currently using WordPress for their site, now might be a great time to consider switching over. Seriously, WordPress is great. It provides incredible flexibility, ease of use, and power. If you are not ready to make the switch just yet there still is a way you can use Events Calendar PRO for your church’s calendar: create a WordPress site specifically for the calendar and ticketing plugins and link to it from the church’s main site. We’ve done this with WP Shindig so you can see what this would look like. A stand alone calendar site can easily be buit in a few hours by your tech team. While this method isn’t ideal, it certainly beats not using Events Calendar PRO at all. Obviously, the best setup would be to have your church’s entire site on WordPress. You will need to purchase a license for Events Calendar PRO. Most likely you’ll only need the ‘Personal’ license, which costs just $65! That’s peanuts compared to those database management systems mentioned earlier. Should you desire to sell tickets through Events Calendar PRO you’ll also have to pick up a license for one of our many ticket add-ons. The ‘Personal’ license for one of these add-ons is $65 as well. Once you’ve purchased and installed the plugins, you’re ready to start adding events to the calendar! While data entry will be the most time consuming portion of the setup, it is well worth it in the end. 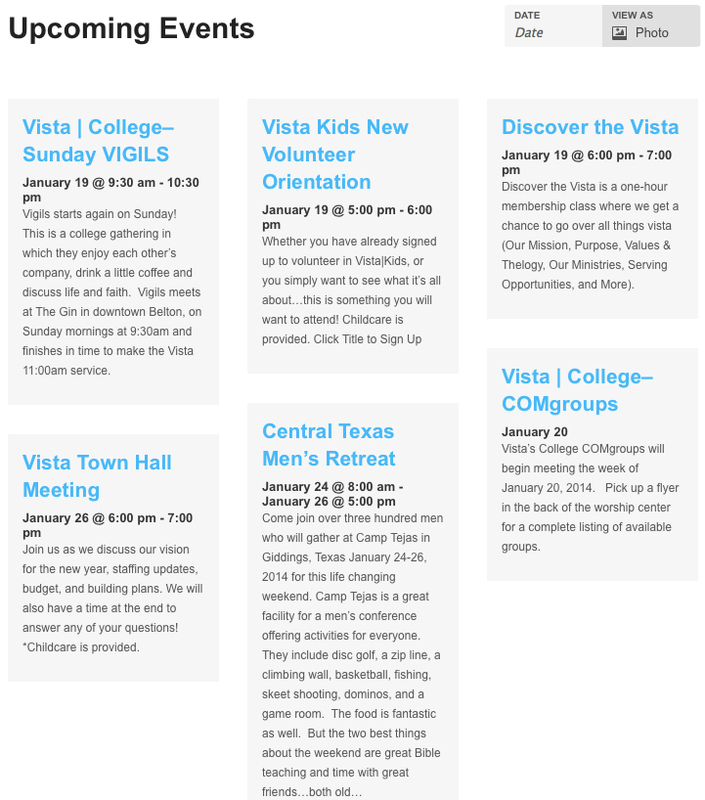 You’ll have a beautiful calendar, full of events from all the ministries in your church, in a centralized, easy to navigate calendar for your whole community. We call that winning! Events Calendar PRO is so intuitive to use that you won’t have to post a tutorial video or a step-by-step guide. Just share the link to the calendar and your community will know exactly how to find the events they are looking for. If you want to simplify your church’s calendar and make it easier for the people in your community to find the information they need, Events Calendar PRO is the answer. Head over to the Events Calendar PRO page for screenshots and more detailed information. Also, don’t forget to check out WP Shindig for a live demo of Events Calendar PRO. If you have specific questions about implementation don’t hesitate to email pro[at]tri.be, we’d love to talk with you about how Events Calendar PRO can help take the headache out of events at your church! Do either of these programs allow you to limit seating? For instance, if only 20 people are allowed to register, will the event close? That would be awesome! Yes, our ticketing plugins do have this kind of registration capability. You can learn more on the individual products pages, and if you have any questions you can always post a thread in our Pre-Sales forum. Thanks! Is it easy to alow the public to post their own event? What we were hoping was that the public would post their own event, cutting down on he need for admin and mistakes. Once all the information was added an email would presumably be forwarded by the system to an administrator of the callendar to accept or decline this added event. With your system would this process be possible? We have an add-one that does exactly that! It’s called Community Events and allows other people to submit events to your calendar. There are all sorts of control options to do what you describe and more. You can read more about it on the product page. If you have any questions, post a thread in our Pre-Sales forum and we’ll help you out. Thanks! Does the events calendar allow me to have both public and private events that can be seen or hidden based on whether or not the user is currently logged into the WordPress site? Hey, Bnpositive! Thanks for this note and for checking out the plugin. The plugin’s handling of public/private events should work the same way WordPress does, as events are just a custom post type. You could always check out whether the current setup meets your needs by downloading/installing the free The Events Calendar (http://wordpress.org/plugins/the-events-calendar/) to see if its handling of roles is in line with your expectations. As a general rule of thumb, if the free/core version does, the paid/PRO will as well. Hope that helps. Thanks again for reaching out. Let me know if you have other questions from there. Hey, thanks for checking in Outreach. Assuming that you’re talking about this within the context of creating an event entry, then the answer is yes. If you check out this screenshot (https://cloudup.com/c6zYfF2XS9J) it should show the minute-based incremental changes allowed by the plugin at the moment. Hope that helps. Please let me know if it doesn’t. Hi Criss. Thanks for the note here, and for voicing your concerns on this…it’s clear we failed to live up to your expectations here and I apologize on behalf of the team for letting you down. My apologies for the disappointment. If you have further questions or feedback on this you should feel free to email me directly so we can continue the discussion. However, we do like your product, and will continue using it regardless of how you feel about our organization. May the Force wave hir noodly appendages ever in your favor. I am thrilled with the options using the calendar plugins, but I am a bit puzzled at the pricing for the amount of features in the paid versions. The Community plugin doesn’t seem to offer that many features to be the same price as the PRO plugin. Is there some sort of price break offered if you buy them both? Hey Bettie! Thanks for your note here, and for checking out our plugins. You raise a great question here and I’m happy to answer it best I can. You are correct that there is a bit of a disconnect between the featuresets on PRO versus the rest of our premium add-ons. Our thinking here is this: PRO comes with a higher number of features than any of the other premium add-ons, since its the most popular and most likely to be used by folks coming from the free The Events Calendar. We wanted to throw the community as big a bone as we could on this front and as a result packed a ton of features into the plugin. Realistically we could probably have the functionality that makes up PRO split out between two or three different premium ($65) plugins, since there is so much going on in that plugin’s codebase…but we didn’t feel that’d be right. We do feel more comfortable charging more for the other premium add-ons, since the $65 license fee for plugins like Community Events is more in line with the amount it costs us to support + continue developing this plugin. While we don’t have any bundles or price breaks at the moment, we occasionally have promotions that offer discounted package pricing and I encourage you to sign up for our newsletter or follow us on Twitter/Facebook to ensure you’re cued into these when they happen. I hope this helps explain things a bit. If it doesn’t, please do let me know and I can elaborate. Thanks again for your interest. Hello. I’m have a bit of trouble with my purchased Events Cal Pro. For the life of me, I can not seem to get my upcoming classes to display on the calendar. When I go in to create a new event, it shows up as text on the page, not on the calendar in the box of the respective date. Very confusing. I’ve changed the view from list to calendar and still nothing. I need to send an E-Newsletter out today with links to register for our classes, but I can’t do that until I get the calendar view situation straightened out. I want folks to click on the link in my newsletter, be directed to my “training” page on my website, view the calendar of events (that’s the part I can’t figure out), register for said event, pay and be done. Please help!! *having a bit of trouble* Please excuse the typos in my previous post! I’m sorry to hear about the inconvenience you’ve faced so far, mspointers – have you already posted a forum thread to this effect? We generally monitor the forums way more actively than we do these comments, so the odds of getting a timely/substantive reply are far greater over at the forums. Let us know (at http://tri.be/support/forums) and we’ll do our best to get you sorted from there. Is there a function to “copy” an event and rename it? Each Sunday Church event has a different title, though the information on the event stay the same. We are using the PRO version – any help would be appreciated. Hey Rachel! Thanks for the note here. Event duplication is not doable out of the box at the moment, but there are a number of third-party plugins that should do the trick just here. In fact I see we had a user who published a blog post last year on this very topic…appears he found a solution that will meet his needs: http://consciousimages.com/duplicating-events-in-the-events-calendar/. Any chance that Post Duplicator could accomplish what you’re going for? Hey Leslie! Apologies that we took some time to get you a reply, this was stuck in “Unapproved” limbo and I didn’t see it until now. Having events show for a local time zone would require some additional work – as it stands they rely on the timezone for the WordPress site itself, not the end users. If you were interested in getting in touch with a developer who might be able to accomplish that for you…we have a list of 10 or so freelance devs who we can vouch for and refer work to. Shoot me an email (pro @ tri.be) if you were interested in getting a copy of that. Hey LT. A built-in email reminder is a cool idea, but at the moment no such functionality exists. Yours is actually the first request I’ve seen along these lines…we’re always open to feedback on ideas people would like to see implemented. If there is enough demand in the community we’re open to exploring those, and ask that the conversation there start at our UserVoice page: http://tribe.uservoice.com/forums/195723-feature-ideas. If you propose this there it’ll be present next time other users check that page out, and they’ll be able to vote it up if they agree it’s a cool idea. Hope that helps and sorry I couldn’t offer up more! If you have other questions, please let us know.